Paintings and their composite materials will have their own individual response when exposed to moisture and water damage. Paintings on wood panels or boards may develop cracks, warp, or split. Canvas supports may develop wave-like distortion, or lay slack upon its wood stretcher. Water may seep into the fine cracks of a paint layer and result in weakening or dissolving the underlying layers of the painting. Paint layers and mixed media will swell and shrink with potential to crack, or separate and detach from the support. Materials swell or expand when in contact with water or with the increase of moisture in the environment. 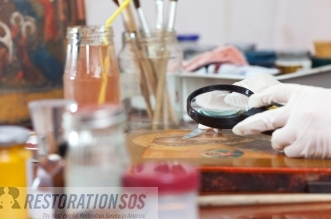 It is recommended that paintings will be salvaged and dried out by a professional because when the moisture or water decreases, the materials dry and shrink. This expansion and shrinkage of materials may cause more damage. The order of removal and treatment is: First, the most highly valued; second, the least damaged; third, slightly damaged; and fourth, severely damaged. If you choose to salvage your paper items yourself, start with learning the basic methods of paper salvage and be sure to start with drying out the room to improve indoor conditions and reduce humidity levels. Separate the lightly damp paintings from those showing structural damage and water saturation. Signs of structural damage include tears in the canvas, flaking, lifting, and dissolving of paint and ground layers. Set up tabletops or other flat surfaces, pad the surface with blotters and cover with plastic. Let the structurally damaged paintings dry, face up in a horizontal position, on the surface. To dry structurally safe paintings, set up several layers of blotter on the table. Add a layer of absorbent paper. Unframe the painting, but leave it attached to the stretcher. Lay it on the surface facing down while confirming that the paper is not wrinkled. Cut blotters to the inside dimensions of the stretcher frame. Cover the back of the canvas with a blotter. Change the blotter until the canvas is dry.